Programmers make the newest kind of people. They are mostly misunderstood by other people, who do not understand the mathematical exactitude of coding. Either the code works or doesn’t, leaving no room for any argument. Therefore other people are mostly unable to connect with them. When castes are independent, they work better than trade unions. Once you become really good at something, you cannot be doing that forever for free. System at SANGKRIT.net is working hard to make programming a very successful business for every professional programmer across all the countries alike. Traditionally successful business gets genetically casted. That has been a part of human evolution. Castes are also good or bad on the basis of only being independent or subordinate. When castes are independent, they work better than trade unions. Programmers have always been very independent people. Their getting that much professional is a necessity of our times. 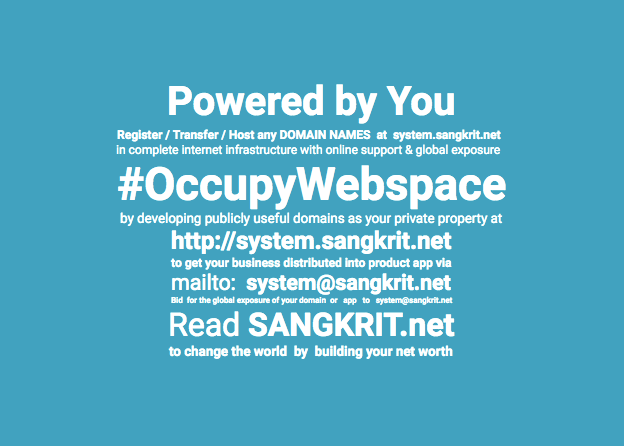 Transforming everyone into two main vocations is the global task given at SANGKRIT.net. These two vocations are destined to transform whole world. From hunters and gatherers of stone age, men and women are finally getting transformed in to programmers and domainers of internet age. All the smart women must become domain registrants by registering their domain names at http://system.sangkrit.net and likewise all the smart men must be programming their world via system@sangkrit.net charging hourly per terminal.